MIDLAND PARK, N.J. - May 9, 2011 - Going well beyond its role as a provider of landscape services to northern New Jersey businesses and residents for the past three decades, Jacobsen Landscape Design and Construction has made it part of its corporate philosophy to support the local arts and artists in a variety of unique ways. At the core of its support is the open use of its beautiful new Landscape Gallery at Barnstable Court in the heart of Saddle River. 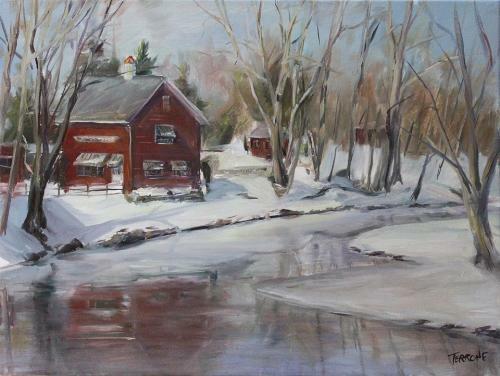 Nestled between two peaceful rivers and shaded by an abundance of natural vegetation and trees, the Landscape Gallery has hosted dozens of art-related events in the past year, with many more planned for the remainder of 2011. "Jacobsen Landscape has always been connected to the arts through our designers and their work," says Glenn Jacobsen, CLP, founder and owner of the 33-year-old privately owned landscape firm. "We have always been dedicated to giving back to the community that supports us so well and by supporting local arts and artists we can do just that." Jacobsen points out that one of the reasons the company opened the Landscape Gallery in Saddle River, in addition to its Design Center in Midland Park, was to provide a place for residents to experience landscape design ideas in a natural setting. "Artists need support and exposure and we are glad to open our doors to them," Jacobsen adds. "It is a natural relationship between landscape design and art." Jeff Martini, Vice President-Business Development, takes Jacobsen Landscape's commitment to the arts even further. "We employ a group of talented designers and they are all artists, so we have a natural tendency to support the arts," he explains. "There is a direct relationship between landscape design and the arts and we encourage local artists to find their inspiration at our location." The landscape company's initial foray into the arts took place in 2009 when it hosted a well-received art show for local artists shortly after the Landscape Gallery opened that summer. Dozens of artists showed their works to hundreds of attendees and a natural partnership with the arts emerged. Glen Rock artist Joe Terrone, who spearheaded that initial art show in 2009 and specializes in Plein Air paintings, frequently uses the Gallery for inspiration for his art and art classes. 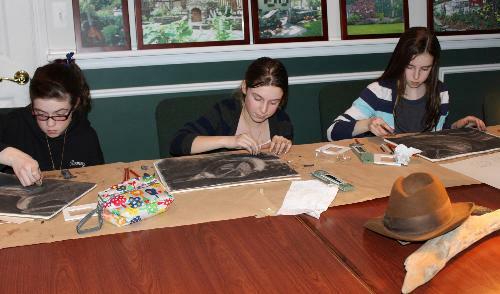 He also conducts an art class for local students and seniors at the Jacobsen Landscape Design Center in Midland Park. "There is a undeniable connection between painting a landscape and planting a garden," Terrone explains. "The colors, lighting, layering and structure, along with finding a focal point, are vital parts of both efforts, which is why I enjoy the connection so much." * Local artist Rina Goldhagen is conducting art classes at the Gallery this spring for aspiring local artists. * Classes in Feng Shui garden design are conducted at the Gallery by local artist Lois Kramer, who utilizes the bucolic setting as an example of what can be accomplished when nature and art meet. * Wendy Morris, of Pottery Peace in Chestnut Ridge, N.Y., has conducted sessions for her students at the Landscape Gallery, including classes on throwing pots for children and young adults. * The peaceful setting has hosted a yoga class recently and more classes are planned for later this year as the weather continues to warm. "We open our doors to the local art community to join us in enjoying our Gallery, " points out Martini. "But one of the most surprising instances was when a wedding party celebrating across the pond at Saddle River Inn strolled over the wooden bridge for photographs among the gardens. That kind of experience makes all the hard work worthwhile. " Local artists or organizations interested in using the Jacobsen Landscape Gallery in Saddle River for a function can contact Martini at 201-891-1199; jeff.martini@jacobsenlandscape.com; or visit the company's website at www.jacobsenlandscape.com.